ANAHEIM, Calif. -- It had been 350 days since Ken Roczen left Angel Stadium in the back of an ambulance after a horrific crash in the third race of the 2017 Supercross season nearly ended his career, but he was back on the starting line in Anaheim for the 2018 season-opener. It was as unlikely a comeback as any in sports, a story few people believed would be written so quickly. 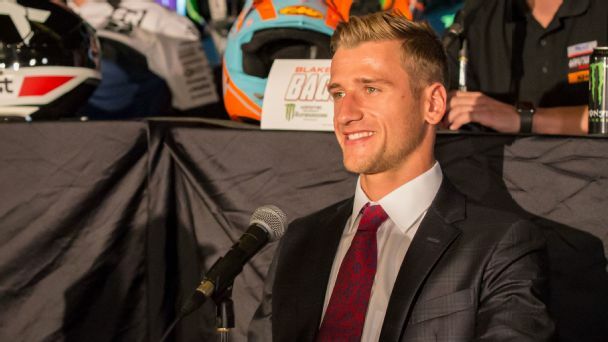 "I think more than half of people thought I was done," Roczen said in an interview with ESPN.com on Monday. "Maybe everybody. At first, we thought we were done." Roczen set the fastest lap time in qualifying on Saturday and finished fourth in the 450 Main Event behind Marvin Musquin, Jason Anderson and Justin Barcia in the 23-year-old's remarkable return to racing. "I would have liked a podium, but honestly, I'm where I wanted to be," Roczen said. "All in all, I'm happy the first one is over. It was good to be around the madness and other riders again. There are things you can't practice unless you go racing. On Sunday, I was already looking forward to next weekend [in Houston]. It showed me how much fun I have going to the races and being with my team." He knows no matter how well his season is going, it can end in an instant. Roczen entered the 2017 season in the best shape of his life and as confident as he'd been in his career. He was coming off his second AMA Motocross championship and a runner-up finish in the Supercross title race behind Ryan Dungey in 2016. He arrived in Anaheim for the opening-round media conference wearing a tailored suit, NBA style, while his peers wore traditional collared pit shirts. "I want to elevate the sport," he said that day. Roczen was on a new bike and with a new team, Honda, and had opened the season with a pair of wins in Anaheim and San Diego. Then midway through the main event of that third race he crashed, flew 30 feet from his bike and landed on the face of a jump. His left arm took the brunt of the impact. "When I hit the ground, the first thing I felt was disappointment," Roczen said. "Things were almost going too well and then that happened. The first couple of days were miserable." Roczen spent one night in a nearby hospital in Irvine. The next morning, Roczen's agent hired a private plane to fly him to the Steadman Clinic in Vail, Colorado. There he underwent the first of 11 surgeries between January and July to repair compound fractures to his radius and ulna, scaphoid fractures, torn ligaments and a dislocated elbow. "I don't remember a lot about those first weeks, but I remember the doctor came in that first day and said we needed to do surgery right away because I had compartment syndrome and was at risk of losing my arm," Roczen said. Once that initial surgery relieved pressure in his arm and the swelling began to subside, further X-rays revealed the severity of the damage. "It got worse and worse as the weeks went on." At the time, Roczen didn't want to talk about dirt bikes, watch the races or hear about who had finished in what place. He knew he had a long road to recovery ahead and doubted whether he would race again. "It was 'What if, what if, what if,'" Roczen said. "But I didn't hold on to that negativity for long." Once his incisions healed, Roczen spent time with his fiancée Courtney and their French bulldog, Rio, wake surfing in the lake near their home in central Florida. "That helped bridge the gaps between the bad times," he said. In the fall, he got back on the motorcycle and slowly began figuring out how to make adjustments for a left arm he says will never function at 100 percent. His elbow doesn't fully straighten, he has little range of motion in his wrist and he still deals with nerve pain and numbness in his hand and arm. To compensate, he rides in a wrist brace and has a thicker left grip on his handlebars. "I knew if I was going to race again, I had to deal with whatever it took," he said. "I went through a lot of pain and hours of physical therapy to ride like I want to ride." Saturday was his first opportunity to test all that recovery work when he lined up in a 22-man start gate for the first time in nearly a year. "I was surprisingly calm," he said. "I was more nervous a few days before [the race] than in that actual moment. But I was terrible in my starts. I dumped the clutch and ended up in the back and it was sketchy back there. When I got into the top six or seven, the front guys were really far gone." Roczen went into the race with a plan and he said he stuck to it. He remained patient, kept his calm and didn't override the track or take unnecessary risks. Most importantly, he didn't crash and logged a solid finish. "All I wanted to do was not make a huge mistake," he said. "You can't win the championship in the first round, but you can throw it away. I want to be in it for the championship." He did have one close-call in the rhythm section before the triple jump, which caused him to drop back a few spots. "I wasn't too stoked on the bike [on Saturday]. The shock was soft, I tried to scrub the jump, hit my foot peg into the ground and ripped my foot off the foot peg," he said. "It was a scary moment, but I tried not to let that freak me out too much." He said his team worked on the bike at practice on Monday and stiffened his suspension. "If that hadn't happened, I think I would have gotten on the podium," he said. That's his goal this weekend at NRG Stadium in Houston. "I want to stay calm, but I know if I work on my start and figure out the bike, everything will fall into place," he said. "But I'm not going to go balls-to-the-wall just because I have one race under my belt. I'm in it for the long haul."